Moorings are subject to management, regulation and waitlists. What should you expect at various harbors? SOUTHERN CALIFORNIA — One of The Log’s readers recently reached out to us with questions about the mooring inspection and renewal process in Newport Beach. The city is one of a few in Southern California where boaters have the ability to “park” on open water. Mooring a boat, of course, does not come without regulations. Many rules deal with transferability, payment and where mooring or anchoring is not allowed. Some regulations clarify what activities are and are not allowed in mooring areas. Renting a mooring sometimes come with time restrictions, limiting the rental period to 72 consecutive hours or seven days total per month (regardless of when those seven days occur). All cities and port districts also have established mooring maintenance requirements. The schedule to lift, inspect and (possibly) repair moorings vary from harbor to harbor, with many requiring renewal annually or every other year. California’s Division of Boating and Waterways does not oversee the process of mooring inspections and renewals, according to a California State Parks spokesperson. Mooring fields also exist in Santa Barbara, Catalina Island, Redondo Beach and San Diego. Below is a quick snapshot of mooring and inspection regulations at select harbors across Southern California. Newport Beach’s Harbor Code requires moorings to be lifted for inspection and repairs or replaced once every two years, according to the Harbor Resource Department. Marine contractors, such as South Mooring Co. in Newport Beach, must certify the results of any inspections they perform. Only once a verified company has certified the inspection is the mooring renewal approved. Any company servicing moorings in Newport Beach, according to city staff, must be a contractor – which comes with its own licensing requirements. South Mooring Co. in Newport Beach, for example, maintains an active contractor’s license, according to Contractors State License Board. South Mooring Co., a city-approved contractor, has a $15,000 contract bond, according to its license. The Newport Mooring Association did not respond to The Log’s questions about this story. A representative from South Mooring Co. stated all questions about licensing and inspections be directed to city officials. Newport Beach, beyond inspection and renewal practices, is working on a new mooring concept near Balboa Peninsula’s Marina Park. Harbormaster Dennis Durgan installed a few sand-line moorings in the harbor, similar to what’s being used by boaters at Catalina Island. No moorings are found within the confines of Santa Barbara Harbor. There are, however, 45 city-permitted, single-point moorings in open water. Moorings are not permitted for transient use and cost $250 to use, regardless of size. The city no longer maintains a lottery system to assign moorings. Santa Barbara’s Municipal Code requires all mooring permit holders to possess and maintain an operable vessel. Permits are one-year in length, non-transferable and not offered for commercial uses. The city governs the inspection process, similar to Newport Beach. A permit holder must install the mooring within 90 days of being offered space in the field area. The mooring must be installed in such a way as to prevent drifting, dragging or other form of migration. “Moorings shall be inspected by a city-approved mooring inspector upon installation at the mooring site and annually thereafter on each anniversary date of the issuance of the mooring … to determine compliance with Minimum Ground Tackle Specifications,” the city’s Municipal Code stated. The permit holder would be responsible for all costs associated with the inspection, according to the Municipal Code. Mooring areas at Catalina Island are found at Isthmus Cove, Fourth of July Cove, Cherry Cove, Emerald Bay, Howland’s Landing, Little Geiger, White’s Landing, Moonstone, Hen Rock, Buttonshell, Catalina Harbor and Wells Beach. Private parties generally lease moorings around the island, but individual lines are rented when available. Boaters seeking to sublease a mooring at Two Harbors must sign up on a wait list. The wait time for a mooring, depending on the cove, is between 10 and 32 years, according to the Catalina Island Co.
Moorings within Avalon city limits are inspected annually, with permit holders expected to lift their lines for inspection and possible repair before May 25 each year, per Municipal Code regulations. Avalon residents who also own boats (and maintain a vessel in the harbor as their only residence) are given priority on the application list for city-owned moorings. Redondo Beach’s mooring field for transient boaters is available on a first-come, first served basis and can only be used for seven days at a time within any 30-day period. Boats must be between 26 and 60 feet to be eligible for mooring use. Daily rate for mooring use is $24 for up to 40 feet, $30 for 41-50 feet and $36 for 51-60 feet. A mooring is considered reserved only upon payment. The mooring holder must vacate the field by 12 p.m. on the final day of the reservation. The Redondo Beach Municipal Code does have an entry dedicated to mooring maintenance. All approved moorings, however, must be satisfactorily inspected, according to the Municipal Code. A mooring permit holder is responsible for maintenance and repair costs that arise during the inspection process. Any failure to comply with city regulations causes harbor officials to lift the mooring out of the water and keep it in storage until the permit holder is able to return to compliance. Mission Bay permits mooring use in three areas: San Juan Cove, Santa Barbara Cove and Mariners Basin. 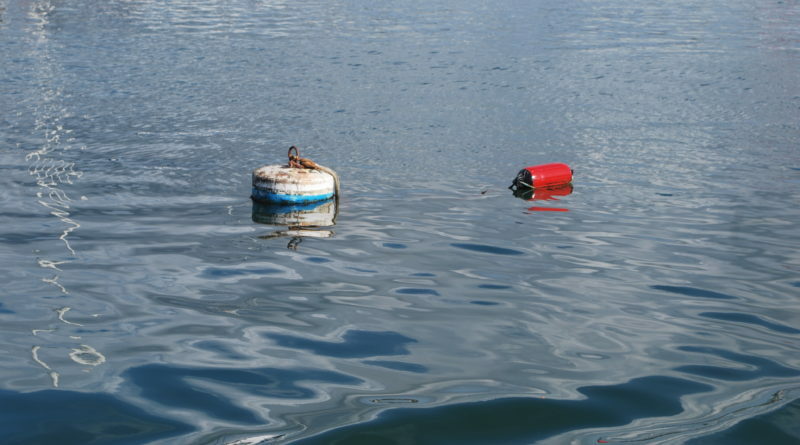 Physical buoys and tackles used as part of the mooring system are considered to be property of the permit holder, according to city staff. Only those owning boats of 25 feet in length or smaller may apply for a mooring permit in Mission Bay. San Diego Mooring Co. offers 462 moorings for rent in America’s Cup Harbor, Coronado, the downtown waterfront and Shelter Island. Crew of the company’s 42-foot barge, Tracy Ann, inspects moorings bi-annually and in the same vein as other harbors or marinas – a mooring is lifted from the water, cleaned, inspected and then reset. Any repairs must be made after inspection and before the reset. Moorings are available in both single-point and double-point (Catalina style). The mooring fields, once owned by the Port of San Diego, were privatized in the early 2000s. Contact the San Diego Mooring Co. at 619-291-0916 for questions about reservations and permitting requirements. Boaters can choose to moor at one of 45 spots off the coast of Long Beach. Belmont Mooring Co. initially began with bow-only moorings to allow for swing – Long Beach is regularly subject to southerlies. Public moorings are not available for those visiting the Channel Islands. Interesting article Parimal but why do you refer to Dennis Durgan, a civilian, as “Harbormaster” when Lt. Alsobrook with the Orange County Sheriff’s Department is the actual Harbormaster in Newport Harbor? This confuses me? As a resident, I see these little “Harbormaster” boats driving around the harbor, picking up trash and stopping boats with no authority to do so. In fact, it is illegal for them to stop boaters. Their existence also confuses me. I totally understand that, as I know the City now handles all the moorings, but the only Harbormaster in Newport is the Orange County Sheriff’s Department. To call Dennis Durgan the Harbormaster is misleading. As I understand it, the Sheriff’s Department still handle all lifesaving, boat fires, illegal activity, and boaters in distress. Dennis Durgan does not do any of this and is not equipped to do any of that, so why is he referred to as the Harbormaster? That is my only question. Thank you in advance for your thoughts and clarification! It would certainly be a question for the city, as Harbormaster is his official title (http://www.newportbeachca.gov/government/departments/public-works/newport-harbor/contact-us). Accordingly it would appear Newport Beach has two harbormasters, at least in title.